If any Indian blogger is planning to make money online from the affiliate marketing then flipkart affiliate program is the best option for them because it is the best online shopping site in India and deals with approximately all important products of daily needs. We all know the online shopping market is growing with 50 % annual growth rate and Flipkart is leading the market and it has very big market share because it offers flexible payment options like cash on delivery which make online shopping easy for those who can’t pay online and because of this flexibility selling products online becomes easier through your website. I love their affiliate program because of many reasons which you can read here in this review in details. 1 – They deals with maximum products of daily needs and common use so the possibility of selling affiliate product is high. 2 – Flipkart is big branded name and No.1 online shopping platform based in India and there are always great chances to sell branded products easily because peoples trust on them. 3 – Its high commision rates is the biggest opportunity to earn more with same efforts for the bloggers by writing product review. 4 – Flipkart affiliate program is easy to join and payment options are also easy for the internet marketers to get paid for their income. 5 – Lowest payment threshold of rs. 1000 which is lesser than any other top programs in India. You can read about snap deal affiliate program review also here. Cookie Duration – As per our knowledge is 24 hours from the 1st click of the buyers. 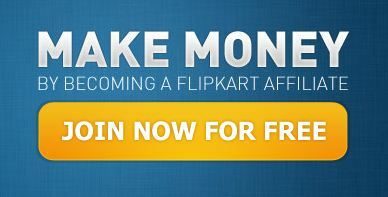 I wish this flipkart affiliate program review will be useful for information seekers and readers of this review post.